A friend of mine just introduced me to an interesting way to interact with the news of the day: it's called "Spectra" and it is a very nice, free, web-based app from MSNBC. 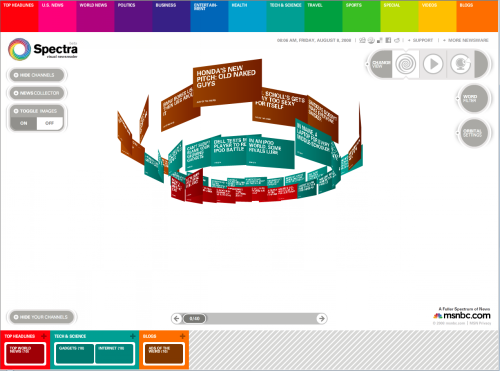 You select the categories you want to view, and Spectra begins to create swirling orbits of news headlines, color-coded by category. When you see a story you want to read, you click on it and you're presented with that article. Not sure it will take the place of things like Google Reader or my favorite offline reader Sharpreader, but it is very fun to play with!